Every morning I like to start off the day with some devotional reading. The idea is to focus the eyes of my heart and mind upon God as I move into the new day. For the past few years I have been using a few books during my morning “quiet time”. The most important book on the shelf is the Bible. All of my devotional reading in the morning is in light of the Word of God. Over the last five years I have been reading and re-reading the morning devotional, My Utmost for His Highest by Oswald Chambers. God has greatly used the thoughts and words of this man, from the early 1900’s, to affect and form my life as a follower of Christ. Another book from Chambers that I have been reading is Run Today’s Race. This little book is a compilation of daily quotes from Chambers that he would post on the door of the mess hall/chapel when he was ministering to the British troops in Egypt during World War I. Chambers' words are obviously derived from a life of prayer and abandoned commitment to Jesus Christ. They always pierce my heart deeply and oftentimes painfully as in response I am compelled to submit my life to the forming hand of God. For the past two years I have been reading Listening to Your Life: Daily Meditations with Frederick Buechner by Frederick Buechner. This book is a compilation of 366 excerpts from Buechner’s writings that serve as diverse and thoughtful meditations on faith in God and living the Christian life. I have been challenged to look at life and experiences in a different way through Buechner’s writings. Last year I also started going through The Diary of an Old Soul by George MacDonald. This is a book of devotional poetry that has served as a thoughtful challenge day after day. At times I struggled to understand the poetic thoughts of MacDonald but I think that is part of the literary dynamic of poetry. Each of these devotional books has served to compliment one another as I have read them morning after morning. The diversity in their messages combined with the Word of God have shown me that God’s guiding Spirit is realized in the diverse perspectives of followers from around the world and from different eras. This year of 2008, I am going to lay these books aside (except for Run Today's Race) and embark on a new book for my morning devotional reading. I am going to work through the book, A Guide to Prayer by Rueben P. Job and Norman Shawchuck. This a devotional book from Upper Room Publishing that includes the Lectionary Readings for each week of the year and focuses upon daily prayer and meditation. The devotional format follows the daily office of: Invocation, a daily reading of a Psalm, a daily Scripture reading, a reading for reflection, a recitation of a written prayer, questions for reflection and a reflection upon the lyrics of a hymn. I am looking forward to delving into this new devotional book as it is my desire to draw closer to God through this daily spiritual discipline. I will keep you posted on how it goes. Question: What do you have planned for devotional reading for 2008? Well, here it is just a few ticks before midnight here in South Korea. It is hard to believe that in just a few minutes the year of 2007 will be over and 2008 will be upon us. As I look back upon this last year I am filled with thankfulness unto God. It has been a good year—I have lots of good memories and I have a few regrets. I want to do better in 2008, in lots ways and areas of my life. It is by Gods’ grace that I have lived the year of 2007 and it is by God’s grace that I will move into 2008. I love the misspellings on Korean signage—they are so “cute” and funny. 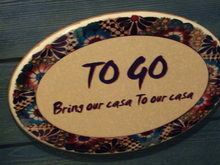 As the sign says in the On the Border restaurant in Seoul, South Korea, it is time TO GO. It is time for all of us to hold onto the good of 2007, let go of the bad of 2007 and TO GO on into 2008 by the wonderful, merciful grace of God. Happy New Year! Living here in South Korea makes TV watching a challenge. It is doable because there are a few channels on TV that do broadcast in English but we figured, "who needs it?" So, we unhooked the TV from the cable in the wall and we moved the TV to the other side of the living room (aesthetics, of course). All we ever watch on TV are DVDs that we choose to watch. No channel surfing, no commercials, no prime-time "junk" being pumped into our home (apartment). Sounds kind of radical doesn't it? It has been great. We have gone one and a half years without a TV. It can be done. We have read lots of books, played games together as a family, practiced our musical instruments more, gotten our homework done, dabbled in other hobby interests and gotten some sleep. Oh, and we have watched some great DVDs. In fact, that is why I started this post in the first place. Recently we watched two great movies on DVD. They are: "Flywheel" and "The Ultimate Gift". If you are going to spend five bucks at Blockbuster these are a couple of movies where you can't go wrong. They are both interesting, entertaining and meaningful. If you are a Christian who can read I must ask, “Are you reading the Bible?” If you are reading the Bible, how are you reading it? Through what lens or perspective are you reading the Bible and interpreting its message? Are you looking for quick answers, easy application and solid confirmation of your previously held beliefs and understandings? Or, are you reading to see and to know God? …..I am reading the Bible differently these days. No more slogans, clichés or bumper sticker theology. I recently finished a course on “Biblical Theology” and I will never be able to read the Bible, hear a sermon or sing a worship chorus the same way again. Biblical theology is means of reading the Bible in light of….the Bible. Crazy thought isn’t it? Until now, I have been inclined to take an isolated verse and/or passage from the Bible and build an entire theological thought or position upon it. In other words…proof texting. I don’t presume to fully understand the scope of Biblical theology except to say that it is about putting isolated Bible verses back into chapters; putting Bible chapters back into Biblical books; putting the Biblical books back into the entire canon of Scripture and looking at the Bible message in light of the religious, political, social and historical climate in which it was written. What did it mean then to the hearers of that day? How does what it meant then play out in meaning to our lives today? There are lots of good Biblical commentaries and resources available to aid in the understanding of Biblical history and context. These are not just for the likes of preachers; they are for any and all of us that can read. The Word of God is not stagnant. It is alive. The story of the living God reaching out to all creation continues. You are a part of that story. 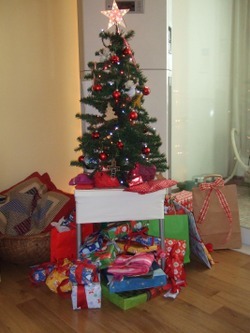 On December 26th, the day after Christmas, we went over to some friends' house for a "Boxing Day" get together. This was a first for us Idahoans. Many of our friends here at TCIS are from Canada, New Zealand and Australia and "Boxing Day" is a national holiday in those places. It was interesting to hear what "Boxing Day" was and/or meant to the group of people at the gathering. For some, "Boxing Day" meant the day to return unwanted gifts and a time to get in on after Christmas sales. For others, "Boxing Day" represented a day where unwanted items were "boxed" up and given to the poor. For us, "Boxing Day" was a chance to get together with friends, share a few laughs and eat some Christmas leftovers. Oh,....and also, Dina made a new friend on Boxing Day. I do not consider myself to be too technologically literate. This Typepad weblog account that I use is so easy it makes it look like I really know what I am doing when it comes to computers. But I don't...yet. About a month ago I signed into the Facebook utility. I did it because I wanted to access a site that was honoring a person that had recently passed away here in South Korea. I did not know that when I signed into Facebook and entered in my email address that it would "find" all of my friends on Facebook and hook us up. It was a weird but nice surprise. 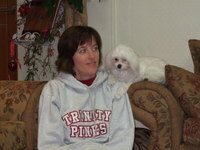 Now I am trying out the Typepad utility of linking my Facebook account with this blog. We will see how it works. It is fun to mess around with this, I just hope I don't royally goof something up. Christmas Eve and Christmas Day are things of the past here in South Korea but the memories of Christmas 2007 are ones that we will treasure for years to come. On Christmas Eve we spent the evening at two places, with two very special groups of people. First, we went to, "Azuma KimBap," the restaurant of our friend, Jaeyoung for dinner. The food was great but our time together was the highlight. 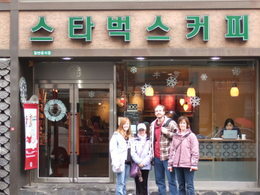 We spent over two hours with Jaeyoung and his family, singing songs and talking about the real meaning of Christmas. Below is great video of Jaeyoung singing "Silver Bells." It was a wonderful time. After we left Jaeyoung's place we walked over to our friends, the Lavender's house. 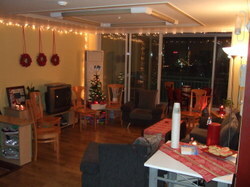 They were hosting a drop-in Christmas Eve party. We enjoyed the latter part of the evening eating Christmas goodies and visiting with friends from TCIS. After the party we walked home and within minutes were "nestled all snug in our beds." Christmas morning dawned upon the land of the morning calm with the signs that Santa had made his appearance on this side of the world. Actually, we all awoke to a clatter to see what was the matter only to realize that Christmas Day was on a Tuesday and Tuesday is trash and recycling day here at our apartment complex and they take recycling serious here in South Korea--obviously even more serious than Christmas morning...so, we took out the trash and then....opened presents. It was a grand time. 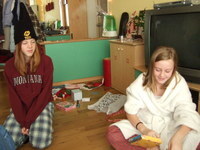 The highlights of the morning included Becca getting a cell phone and Sarah getting an iPod for Christmas. Christmas Day culminated with a wonderful dinner over at our friends, the Zickefoose's home. They invited us and few others from TCIS over for a wonderful dinner. Heidi's great cooking and the Zickefoose hospitality combined for a wonderful time had by all. After our evening at the Zickefooses we returned home to watch on DVD the last half of the Christmas classic, "It's a Wonderful Life." I love Clarence's inscription to George Bailey in the book, Tom Sawyer, "Dear George, remember no man is a failure who has friends. Thanks for the wings, Love Clarence." Friends, (and family) are so precious--love and best wishes to all of you, our friends and family, during this blessed Christmas Season. In the United States I lived in a 2000 square foot house. At Christmas time I would pull thirteen full-sized boxes of Christmas decorations out of my garage and we would spend two full days decorating our home for Christmas. By the time we were finished the place looked great. 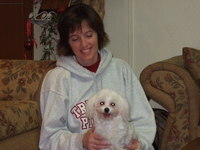 Over the years we had some wonderful Christmas parties and made some lasting memories with precious friends and family. jjjjjjjjjjjjjjjjjjjjjjjjjjjjjjjjjjjjjjjjjjjjjjjkkkkkkkkkkkkkkkkkkkkkkkkkkkkkkkkjjjkkk Currently, Currently, in South Korea, our family of four lives in an 800 square foot apartment. At Christmas time I pull out one mid-sized box of Christmas decorations and a two and a half foot tall tree. Dina works her decorating magic and an hour later the place looks great. Last year and this year we have had some wonderful Christmas parties and have made some lasting memories with precious family and friends.